Gold Coast Veterinary Specialists is a specialty referral hospital serving the veterinary medical needs of Long Island’s north shore pet owners as well as other referring veterinarians. 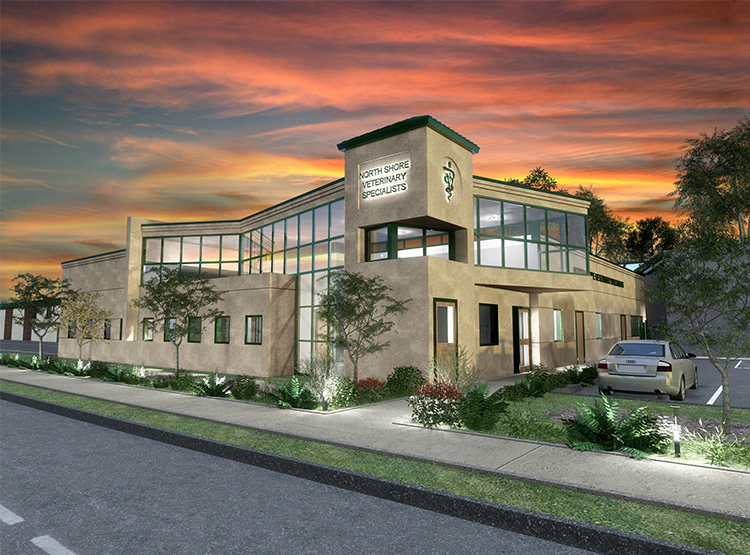 This 5,574 SF is constructed adjacent to the West Hills Animal Hospital that was designed for the same Owner and which previously won a national design award. The new hospital was intended to reflect and harmonize with the colors and materials of the West Hills hospital, yet present a dramatically contemporary look with bold forms, abundant glass and integrated signage. The new hospital shares many of the medical facilities with the existing hospital and provides services that include Cardiology, Dermatology, Electrocardiology, Endoscopy, Neurology, Oncology, Opthamology, Orthopedics and Physical Therapy Services. The green features included are efficient building envelope properties, management of construction waste and building materials, enhanced water conservation and irrigation, and indoor air quality management. The building location maximizes open space and environmental features, has a “white roof” installed, and connectivity with the surrounding community and public transportation services. The building had commissioning services included in the LEED certification, which verified that all of the building heating, ventilation and air conditioning (HVAC) equipment was fully tested and performed as required in the original design documentation. This service was imperative to ensure critical areas such as treatment and operating rooms were operating with-in the temperature, humidity and airlfow requirements of a healthcare facility. An energy simulation/modeling was conducted to verify the building was designed to be more efficient than the local code standards require, along with verification of advanced control systems for lighting and HVAC equipment. The building also received additional credits for utilizing low emitting paint, sealants, coatings with the intent to reduce the quantity of indoor air contaminants that are odorous, irritating and/or harmful to the comfort and well-being of the building occupants. The LEED® (Leadership in Energy and Environmental Design) Green Building Rating System™ is a feature-oriented rating system that awards buildings points for satisfying specified greenbuilding criteria. The six major environmental categories of review include: Sustainable Sites, Water Efficiency, Energy and Atmosphere, Materials and Resources, Indoor Environmental. Quality and Innovation and Design. Certified, Silver, Gold, and Platinum levels of LEED green building certification are awarded based on the total number of points earned within each LEED category. To learn more about LEED, Click here.